1. What kind of coconut oil do you use? It depends on what I do with it. I prefer cold-pressed virgin coconut oil for food preparation as well as for topical use. For higher temperature cooking, I use a high quality organic refined coconut oil. 2. What is the best coconut oil brand? Nowadays there are a lot of coconut oil brands on the market, it’s great to have so much choice. I like to try out different ones, especially those that support local communities and practise sustainable agriculture. In this article I explain about coconut oil labels and what you need to know to buy the best types of coconut oil. I travel often and one of the greatest things about it is to discover new local products. Many of these companies export their products, so you can order on the internet from wherever you are based. You can read their story and by choosing their product you get to support a positive cause that improves someone’s quality of life. Anything crafted with love from pure, natural ingredients and in balance with man and nature just tastes the best! 3. 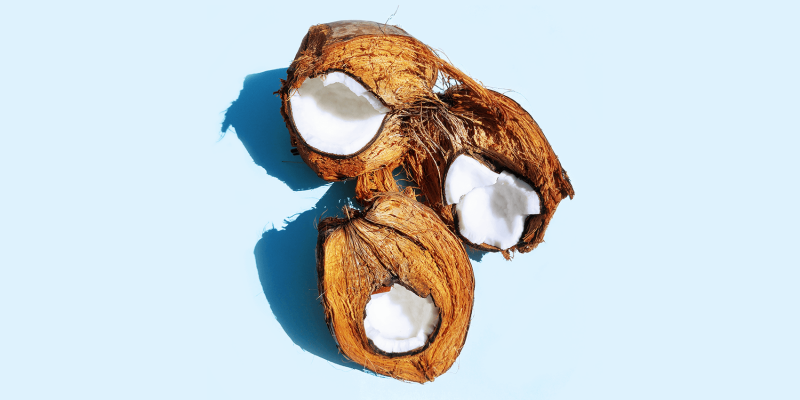 What is oil pulling? Oil pulling is an Ayurvedic practice of swishing oil in your mouth and between your teeth to clean it from toxins and bacteria. It supports healthy gums and helps your body detox, which results in whiter teeth and fresher breath. Coconut oil is especially good for oil pulling due to it antibacterial, anti-fungal, antiviral and anti-parasitic properties. When you are done swishing after about 20 minutes, you spit out the oil and clean your mouth as usual. You can read more about my experience with oil pulling here. 4. How do I oil pull without my jaws getting tired? What if I swallow some oil? Oil pulling is really simple and there isn’t one way to do it, but it can take some getting used to it, so take it slowly! Do what feels comfortable, without setting any time goals or expectations and see how it goes. Take breaks when you need to and build it up on your own pace. While it’s not recommended to swallow the oil as it contains waste from your body that you want to get rid of, don’t worry if you accidentally swallow a bit. You will see that with regular practice, it will become more intuitive and effortless and it’s so worth it! 5. How do you create your recipes? I am a freestyle type of person in the kitchen – unless I am going for something specific, I usually don’t plan much ahead and work with what I have. When I like the outcome, I recap what I put in and how much, so that I know how to make it again. I get my inspiration from people around me and from my travels – my recipes are an eclectic mix of my own kitchen experiments and random findings. 6. What is your food background? I love everything about food! From shopping for ingredients, combining the flavors, creating a nutritionally balanced meal, styling the presentation and sharing it with others. In 2002 I opened a health bar with natural food in Mexico, where I created the menu and did all the food preparation. Mexico is a true food heaven with some of the best produce and flavor combinations in the world. It was a lot of fun coming up with new variations of smoothies, pancakes, desserts, yogurts and salads and then seeing people enjoy them. 7. What kind of diet do you follow? I love real food made from wholesome, natural ingredients. I believe that we are what we eat, therefore I always seek the balance between taste and nutritional value. My diet consists mostly of plant-based food, a lot of fresh fruit and vegetables -preferably organic, local and seasonal- whole grains and beans. I avoid refined white sugar and processed foods in general. My take on diets and food philosophy is do what’s good for you, be conscious, open, in tune with your body and enjoy it! 8. Can I use your recipes and images on my blog? I put a lot of time and effort in creating the content on this is coco. All content such as illustrations, photographs, designs, infographics, website design and animated images is created by me. It is copyright protected and my exclusive intellectual property. I do not allow any reposting of images, unless given prior written permission for by me. See for more information about this in the terms section in the footer of this website. If you wish to share any of my content, please contact me to discuss this. You are very welcome to link to my posts from your blog as well as sharing it on social media using the share buttons located under each post. I do not allow re-posting of any of my posts by copying and pasting or otherwise publishing my content elsewhere. If you have any questions about the above, you can always contact me. 9. Can I use your images to promote my brand? I don’t allow the use of any of my work, unless given prior written permission for by me. If you are interested in licensing options of my images, you are welcome to contact me to discuss the possibilities. 10. Can I hire you to create custom design work for me? I’m happy that you like my work! I am always open to discussing the right kind of collaboration. I love working on projects with soul that radiate passionate, conscious living combined with business know-how and drive. Most of my projects are in some way related to health, wellness, sustainability, creativity & our beautiful planet. If you think we’d make a good match, please get in touch with me here and tell me a bit about yourself and your idea! 11. What kind of services do you offer? 12. Can you help me create meal plans for a medical condition? As I am not a medical doctor or a nutritionist, I cannot assist or provide nutritional advice or meal plans. If you have any question that isn’t answered here, feel free to contact me! I am a coconut-real-foodie sharing my favorite recipes and discoveries with you. I am not a doctor or nutritionist and make no claims about any ingredient curing or preventing any disease or guarantee any outcome. Every person’s body works in a different way and I encourage you to research and experiment with what works the best for you. If you have any health concerns, make sure to consult with a qualified health care provider.